The panel examines pivotal elections in New Jersey and Pennsylvania. Host Matt O'Donnell and the Insiders discuss who has the edge in the New Jersey Gubernatorial race between Phil Murphy (D) and Kim Guadagno (R) heading into election day. We also discuss the issues in the upcoming Philadelphia District Attorney's race, Former D.A. Seth William's sentencing, Rep. Bob Brady's lead strategist gets indicted and the state of criminal justice reform efforts as three Eagles Players head to Harrisburg to discuss a bi-partisan agenda. Catch Inside Story, Sundays at 11:30 a.m. on 6abc. Two political consultants have been charged in a widening campaign finance probe involving the 2012 re-election of Democratic U.S. Rep Bob Brady. Eagles players talk criminal justice reform in Harrisburg. 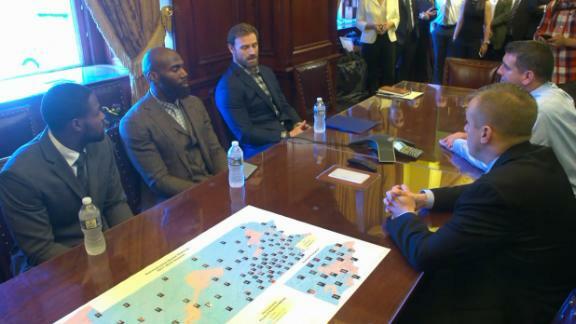 Eagles players went to Harrisburg to lobby Pennsylvania legislators to pass the Clean Slate Act, which would give some nonviolent offenders a better chance to succeed after paying for their crimes.